An amazing brand new luxury villa in the sun for all to enjoy with 3 double bedrooms, large living space, fully fitted kitchen with dining area, satellite TV, beautifully furnished, large outdoor terrace with 8m x 4m pool, car port, Ideal holiday home for kids and oldies. Walking distance to sea and sandy beach at Ayia Triada, close to the bars, restaurants, beaches etc. of Protaras, Pernera, Kapparis and close to the town of Paralimni. This is a perfect location to be based and enjoy the amenities on offer in this beautiful part of Cyprus. 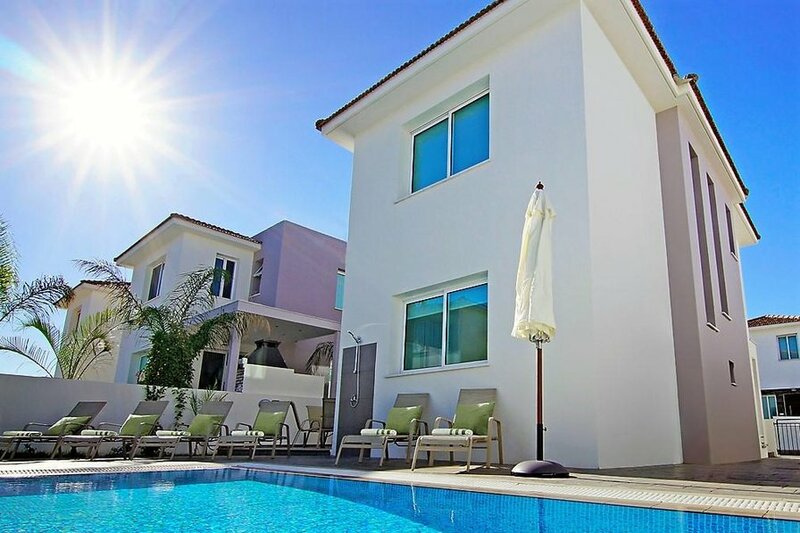 This modern three bedroom villa is tastefully furnished to high standards. Both, its stylish interior and comfortable exterior areas create the perfect combination for memorable holidays. Explore the Pernera - Protaras tourist resort by taking an afternoon's walk. Is a self-catering 2 storey Villa with 3 spacious bedrooms, with 3 double beds; all bedrooms have built in wardrobes with 2 bathrooms upstairs, and 1 guest toilet downstairs. One bathroom is with shower, toilet and wash basin, second bathroom is en-suite with bath, toilet and wash basin, and third guest toilet downstairs is a Separate toilet with wash basin. Air conditioning and heating in living area and all bedrooms. The ground floor is very spacious with open plan lounge kitchen and dining area. There are TV, Satellite TV, and DVD player. The dining area is furnished with a dining table that comfortably seats six guests and large open plan fully equipped kitchen: fringe/freezer, cooker, microwave, toaster, kettle, washing machine, dishwasher, water cooler, ironing facilities, oven, extractor fan, all cooking utensils. The living room is furnished with modern sofas. The garden is fenced for privacy with a private pool (8 x 4 meters) with sun beds, umbrella, outdoor shower and furniture. Private parking is available free of charge. The villa is located in Pernera one of the most attractive resorts of Cyprus. A couple of minutes walk you will find bars, excellent taverns and restaurants, supermarkets, banks, kiosks and car hire rental offices. Larnaca airport is about 40 minutes drive from villa. The villa ideally situated and equipped offers pure relaxation and family-orientated holiday on one of the most attractive Cyprus beaches with Boat trips, Scuba diving, Fishing, swimming and diving, and all kind of Water sports.